Visualize the blue sixteen-petalled lotus Vishuddha chakra with the yellow Alpha plasma superimposed over it at your throat. Hold this visualization and feel the two intermingle as you chant the sacred letter HRAUM as long as your breath can sustain it. 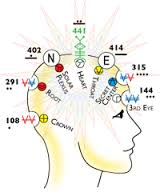 Locate Heptad Gate 414 and the Hyper electron symbol on the 441 holomind perceiver. Its matrix location is V11:H14, eighth circuit, 9th time dimension, inner core time. Now locate it in your body at front, center top of your skull. 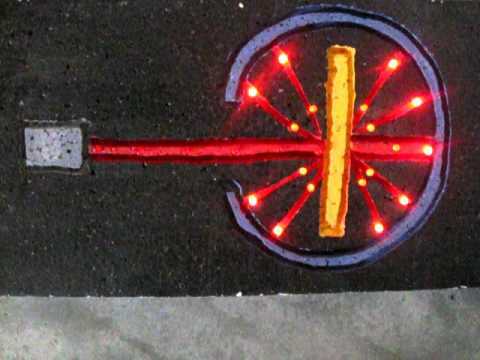 Visualize the Hyper electron with the spiraling red Kuali force field above the yellow Alpha in your throat chakra. Take the Hyper electron into the fifth mental sphere in the fifth time dimension (red Kuali electro thermic force field H11:V1-7, right-handed time) where it activates the superconscious as hyper electronic superconscious informing mental spheres one and two. From the fifth mental sphere, mentally direct the black Hyper electron to the throat chakra and impress it above the Alpha seal. Hold this with four alternate nostril breaths (four times in and out through each nostril), followed by one breath through both nostrils. Descend down the central column (spine), secreting the Hyper electron (red kuali force field) into all 144,000 etheric fibers of the astral body. Practice the breath of fire, rapid shallow breathing through the nose, transmuting any blockages or obscurations into streams of crystal clear hyper electronic superconscious spreading through your entire nervous system. The black Hyper electron with spectral, electric red Kuali force field vibrates subtle activating electronic force into all etheric fibers. Descend back down central channel and leave Alpha at the throat chakra. Return your consciousness to the fifth mental sphere, then close and seal the Heptad Gate at the front top-center of your skull. Relax and breathe slowly and deeply at least 13 times. Harmonic UR rune 90: Galactic Art Whole Defined by Time. For additional practice: Locate Heptad Gate 414 on the Hunab Ku 21. Note that it corresponds to the Enlightened One, the Bringer of the Higher Truth, the Renewer of Life, Holder of the Time space Wisdom; G/K Pluto, Bode Number 388. Sit in a comfortable meditative posture. Keep your spine erect and body relaxed. With the body completely still, practice a few moments of natural mind meditation. Keep eyes slightly open looking toward the floor. Feel your intrinsic dignity in this posture. In this position, watch your breath. Breathe normally. As you become aware of your thoughts just label them “thinking”, and as you exhale, dissolve the thoughts. It matters not the nature or content of the thoughts, just dissolve them. At that very moment, just as the thought dissolves, lies the GAP between thoughts. It is this GAP that you want to become familiar with and cultivate. It is the seed of natural mind and the key to your true, authentic self. Practice this each day and note the subtle shifts in your perceptions and attitudes. Once the mind is sufficiently clear, direct your attention to your throat or Vishuddha chakra. Make it as clear and pristine as possible, glistening and sparkling with vibrant energy. When it is pure and translucent, radiating from your throat, allow it to dissolve and transform itself into a blue sixteen-petalled lotus. Concentrate on this area inside of your throat chakra. This center contains the will to communicate and to extend oneself to others in patterns of informative thought and behavior. The Vishuddha chakra is the channel of communication bringing the fourth dimension through to the third dimension. This deals both with the mental and emotional bodies and is the center for artistic expression and communicating intelligence derived from the higher mental spheres (5th and 6th). The Vishuddha chakra is known by some yogic traditions as the chakra of spiritual rebirth, and in Kundalini yoga as the “fountain of youth”, the place where spontaneous physical rejuvenation begins. To activate the Vishuddha chakra you may recite prayers, sing devotional songs or practice mantra. Chant “Ahhh” seven times to open the throat chakra. This chakra is governed by the feminine principle or Shakti Goddess Shakini (Knowledge). The Vishuddha is also the center of purification and discrimination and the locus of vijnana, or divine analytical wisdom. By focusing our attention on this chakra, we can discriminate between messages from the higher mind from messages of ego. This Vishuddha chakra is related with Nada Yoga, or the branch of Kundalini yoga concerned with sound vibration (Vishuddha and Muladhara are considered to be the two basic centers of vibration). 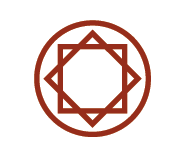 The Muladhara chakra corresponds to the cosmic vibratory root, while the Vishuddha chakra is the receiver of the higher harmonics of the music of the spheres. When this chakra reaches its highest state, sounds emitted take on magical qualities that change the space of the listener through vibration. This chakra can also be used as a receiving station to tune into the thoughts and feelings of people both far and near. This is the super mental reception center of thought-waves and transmissions which discriminates then directs messages to the proper chakra. As this chakra awakens, we can begin to direct the energies of the body from the lower to the higher chakras, reconnecting our expression as higher resonant channels of the cosmos. Note: The nerve channel in the throat is also associated with kurma nadi, the tortoise nadi. When this nadi is awakened the practitioner is able to completely overcome the desire and necessity for food and drink. (This has been demonstrated by many yogis, particularly in India. Examples of such yogis/yoginis can be found in Autobiography of a Yogi, by Sri Paramahansa Yogananda). Vishuddha affirmation: May the vision of the star elders of the great councils of light and wisdom speak through me so that all may ascend to sublime grace!